Happy Tuesday, friends! Did everyone enjoy President’s Day yesterday? I know a lot of people had off from school and work in celebration, so I’m hoping everyone’s feeling rested and ready to take on the week ahead. It’s always a bummer to head back into the grind after a day off, but yesterday’s unbelievably gorgeous weather has filled my happy tank for the week! 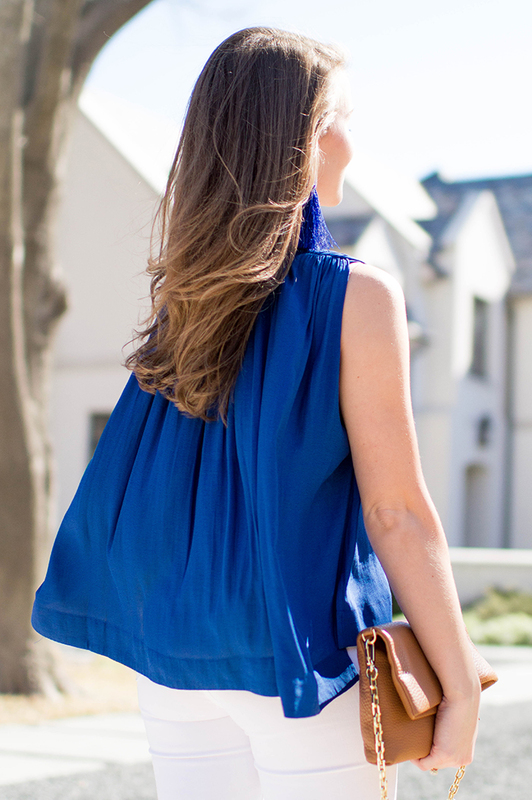 We’re talking low seventies, blue skies, a light breeze… all in all the perfect excuse to pull out this beautiful blue top I’ve had put away for spring! 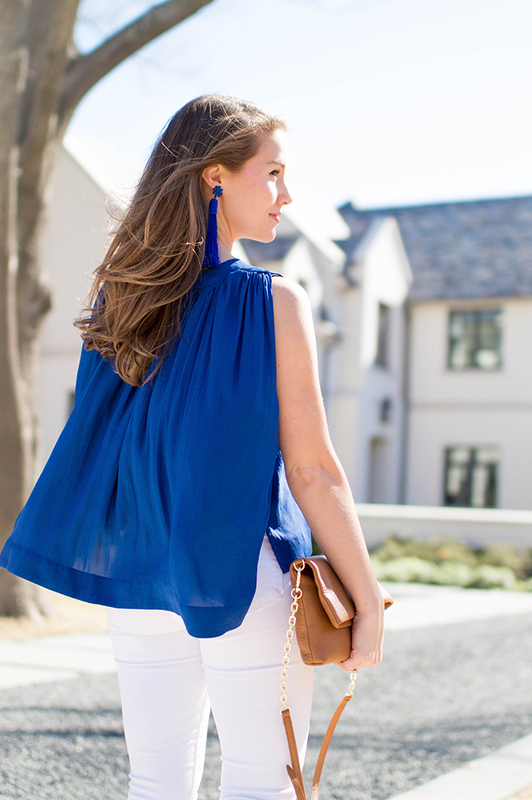 I adore this color of blue… strong enough to make a statement, but versatile enough to be worn a million different ways! I wish you could tell more from the photos, but the back is absolutely gorgeous. The material is wider and longer than it is in the front, and makes almost a cape-like effect as you walk. Such a unique cut that I can’t get enough of, and knew I had to get my mitts on the second I saw it. 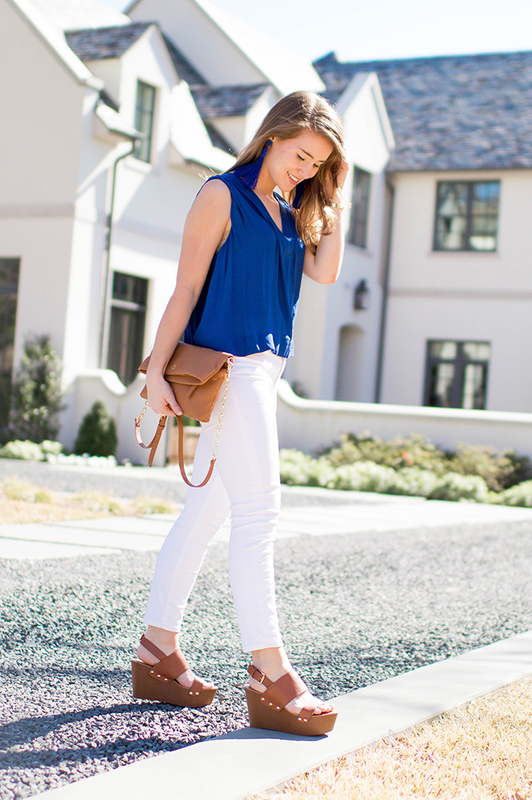 This top comes in four colors, and I’m predicting is going to sell out super quick due to it’s under $100 price tag! So what’s your fancy? Blue, black, green or blush? I couldn’t help myself from playing up the summer vibes yesterday… and you can blame the weather man for that. 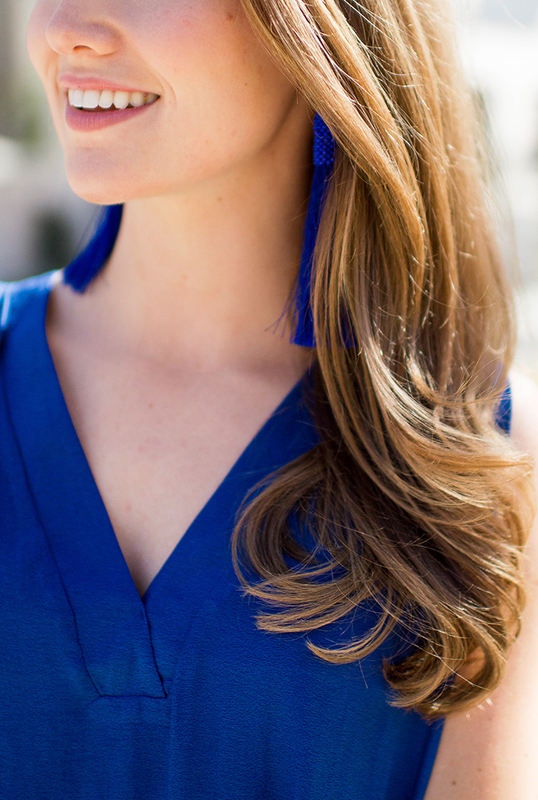 These fun blue tassel earrings made for a perfect, fun touch. I can’t wait to pair them with a million more summery outfits in the coming months! 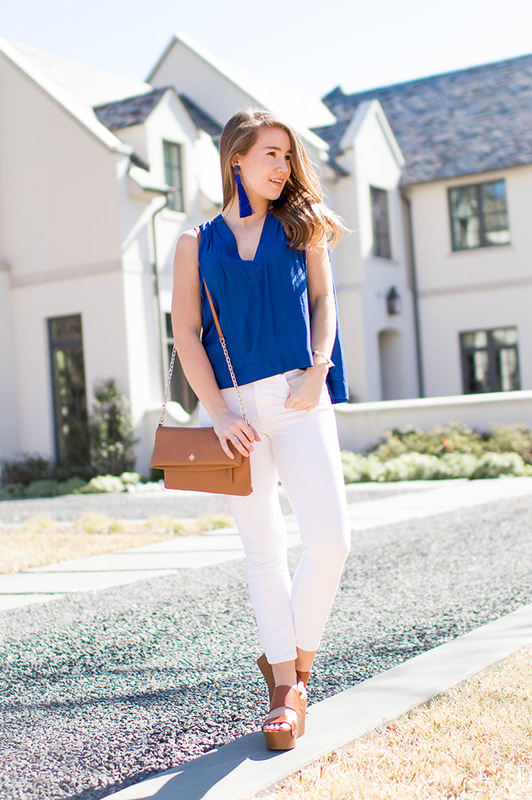 And since I gravitate towards the ever-easy white jeans and wedges combo (my wedges are under $40) adding this crossbody/clutch to the mix made perfect sense. 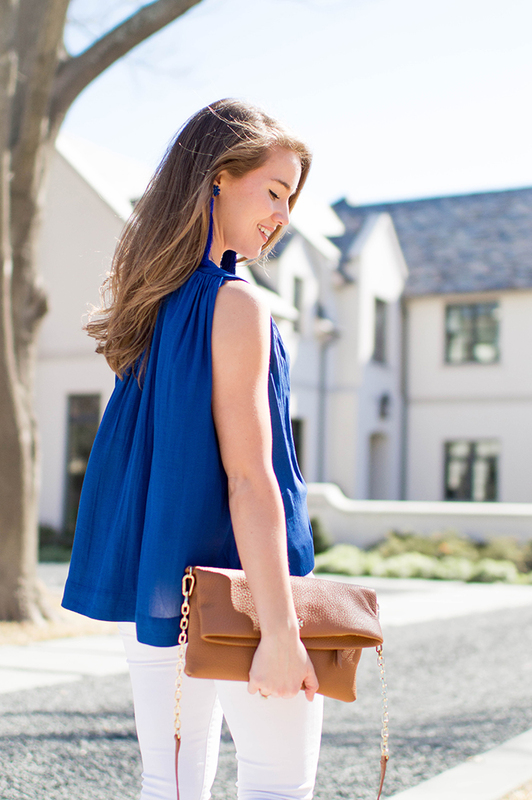 It’s a staple piece I know I’m going to get so much use out of, especially since I’m always needing a beautiful tan clutch! No matter your forecast for the day, I hope it’s a lovely one! This week is going to be a busy one for me, so I’m excited to hit the ground running this morning. Perhaps a fun travel at the end of the week? :) You know I’ll keep you in the loop! That top looks amazing on you! 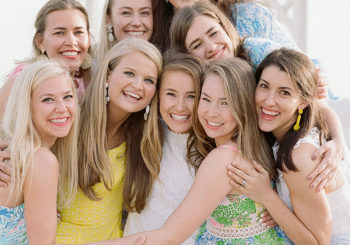 I love how you’ve styled it with the bright blue earrings as well- such a cute look! I cannot wait for a day in the 70s, it ice-rained here! 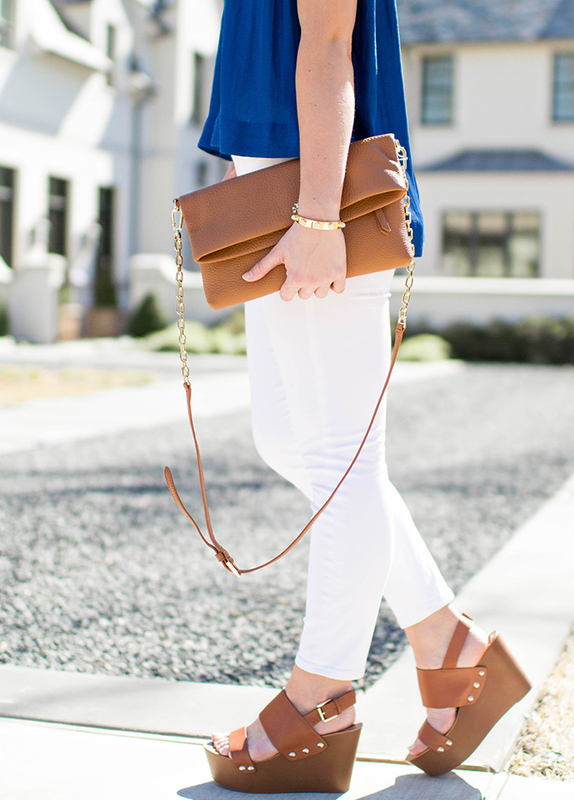 Love that fold-over Tory bag and this look in general! Hope you’re having a great week! Love those earrings, Kate! That is such a good color on you! What a cool top! Love that you paired it with those earrings! Keep seeing those earrings everywhere! I think it’s sign I need them! 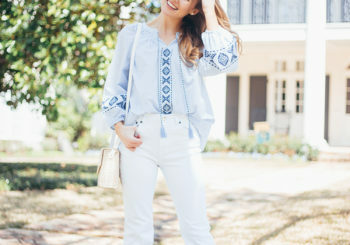 The silhouette of this top is so unique and fresh! Plus, the color is amazing! 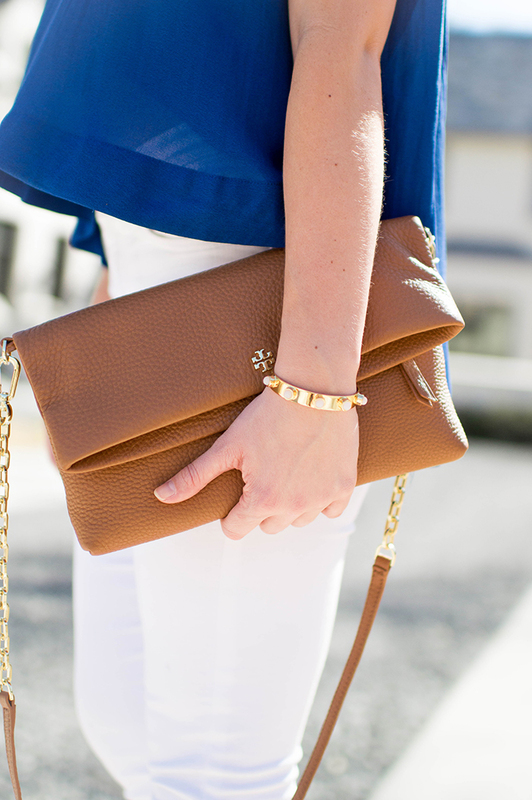 I love that clutch. This blue is a gorgeous color on you, Kate! This is so cute! I love the price of the top too. I love the color of your top, so cute! I love the top! That is my absolute favorite color. Pretty, classy and such a royal look.